I read Damon’s reactionary defensive comments – and while he’s been hypocritical as recently as last year with his call for the US to “ban guns” (never mind that he, along with many major movie stars, have made a ton of money from fetishing gun violence and its lack of consequence), having to defend himself from a mostly mindless attack was unfair. I don’t particularly want to bring politics into a movie review, but in this case it’s unavoidable. I’m largely apolitical, but it isn’t like I’m insensitive to the changing world in which we live. I do feel it’s an issue that most of the big money movie stars perpetuate a mostly-white studio system, then again, they star in movies that are mostly written by white writers, and the studios hire the talent they think (right or wrong) can put up big numbers. So who’s to blame? Probably everybody, I guess – but that includes black writers who mostly only write black-focused movies. If the goal is to increase the appeal of non white actors, these writers need to expand their commercial horizons. It’s worth noting that most movies that feature non-white actors in starring roles are actually written by white men. Ok, topic change: back to the movie. 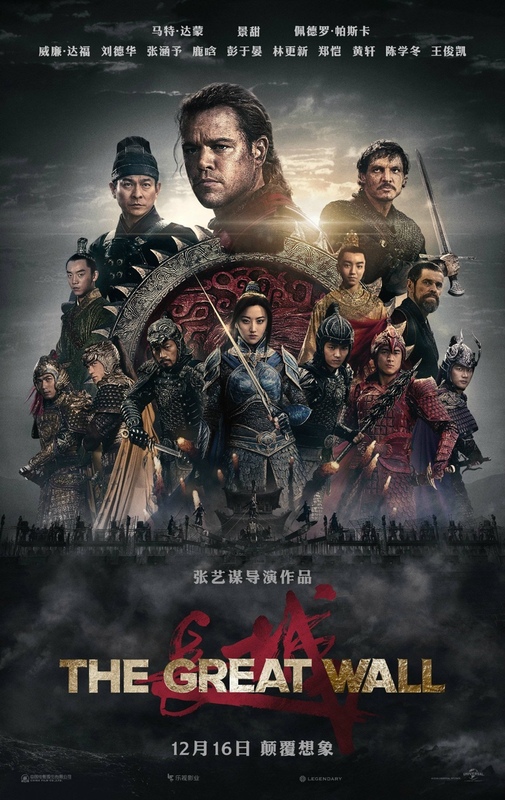 In The Great Wall, Matt Damon plays William, a mercenary seeking to recover the infamous “black powder” and sell it to the West. Scouring the Far East with a small band of fellow mercenaries, William and Tovar (Pedro Pascal, famed for playing the doomed Prince Oberyn on Game Of Thrones) are the two survivors when a creature attacks. Taking a monstrous amputated limb with them, they come across The Great Wall, and are immediately captured. From talking to the giant army, they find that the creature who attacked them is one of a teeming horde of creatures who attack the wall every sixty years. The bulk of the movie is about William and Tovar (mostly William) assisting the army in defending the wall, and to be frank, it’s not a good movie at all. So yeah, lots of problems with this movie, including Damon himself. He just flat out looks like he took the job to pay for a new house. He looks out of shape and plays the role with a kind of detached, uninterested expression through most of the movie. I mostly like Damon, but I prefer when he shows up for work. He didn’t on this movie. But the biggest problem I had was with the monsters themselves. Terrible, terrible design. The things are as big as cars, and kind of look like what you’d get if you threw a frog and a boar into a telepod and hit the blend button. The monsters of course have a leader, the (yawwwwwn) Queen, that you know is going to be the focus of Act 3, and there’s also some badly written mumbo jumbo about how the movie’s maguffin (and an ill-conceived one at that) can somehow block the Queen’s telepathic command system which I can just about bite on, but the actual end of the movie shows a shocking vulnerability within the horde that had me shaking my head at, and muttering, “Rubbish!” Really, it took 1,700 years to find this vulnerability?! Why? And then I realized: they never had a white guy to help them before. I guess Constance Wu was right after all. Movie Review: SHUT IN – a good performance from Naomi Watts overshadowed by the spectacularly bad “WTF?” reveal. Movie Review: ASSASSIN’S CREED – video game adaptation fails to engage as a movie on just about every level.